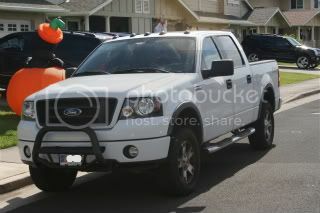 Hunter bull bars allow for the relocation of the license plate, and they look good too. I've got the relocation kit on my westin bull bar. I hate it. I also think it blocks the flow to the lower grill opening which doesn't allow air to flow as well to my transmission cooler. I'd take it off, but Texas requires two license plates has well. The front one only serves as a "target" for the police to aim their laser and radar guns at being that it's highly reflective I guess! In illinois, they WILL stop you for having no front plate. OR a bent front plate for that matter. The pre-pubescent cop-boy who nabbed me told me it was because drug dealers bend their plates so no one can write down the plate number, to which I responded "Just how many dealers distribute their wares with a bedful of tools and building materials while towing a skidsteer A-----E."
Talk about pimpy! That sounds like the same jerk that wrote my buddy a ticket for doing 25 in a 20 zone at 3 in the morning. He said that there were children and families that would be in danger because of him speeding! Sorry, had to share it! didn't even bother relocating it with my Hunter Bull bar. You could clearly see the plate using the OEM mount on the bumper. Bull Bar brackets black where can I get a set without the bull bar? Mine are rusty!